Looking for a quick but also effective way to conduct performance reviews? Use the performance review checklist from Microsoft and be done with your reviews in no time. 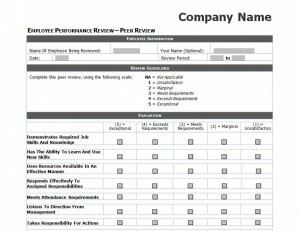 The performance review checklist is a complimentary template courtesy of ChecklistTemplate.net. To download and print the Microsoft performance review checklist, simply click on the link found on this page! The performance review checklist comes in the form of a printable document from Microsoft Word. The already formatted performance review checklist template should come with everything you need. In the event you would like to add or remove something, feel free because the template is completely customizable. The first section on the performance review checklist is for employee information. Here, add the employee’s name, the name of the reviewer and the review period. The next section is dedicated to the review guidelines. When reviewing an employee’s performance, simply mark the corresponding box within each question. Repeat this process throughout using the performance review checklist. Make performance reviews quick and easy from here on out with the performance review checklist from Microsoft. Download and print the template for free today!